The film is set a year after Van Gogh’s death. 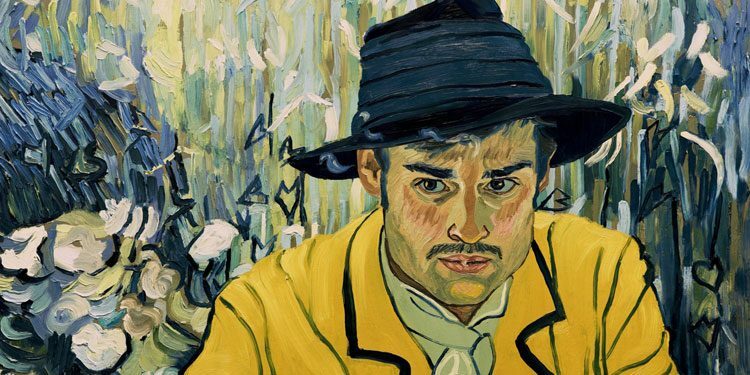 Vincent’s friend from Arles, Postman Joseph Roulin (Chris O’Dowd), forces his slacker son, Armand (Douglas Booth), to hand deliver the artist’s final letter to his brother, Theo. After Armand discovers Theo is also dead, he travels on to the place where Vincent spent his final days, Auvers-sur-Oise, to see whether he should give the letter to the man who was supposed to be looking after him at the time, Dr. Gachet (Jerome Flynn). As Armand finds out more about those final weeks he begins to get increasingly suspicious and even starts to wonder whether Van Gogh was actually murdered. Loving Vincent is a film that’s not just visually ambitious, but also narratively bold. It’s attempt to tell Vincent’s story in flashback from after his death through the eyes of those who knew him is a brave gambit and one that’s only partially successful. Particularly early on its almost Citizen Kane-esque structure feels a little gimmicky, especially for those who know Vincent’s art, as it introduces a succession of the people who featured in Van Gogh’s art, turning the story into less of an examination of the artist and more a slightly melodramatic pot-boiler murder mystery. It almost upends the entire movie, as it makes you start to wonder whether the painted visuals are also a bit of a self-satisfied gimmick, particularly as nearly every shot is a recreation of one of Vincent’s paintings. For about the first 30 minutes I was finding the whole thing a little precious and finding it slightly difficult to understand why it had gained such a good critical reaction. It’s certainly pretty to look at but has a slightly sloppy story that mainly seems interested in patting itself on the back for finding ways to shoehorn in succession of Van Gogh’s masterpieces. However, once Armand reach Auvers-Sur-Oise, the magic of the visuals begin to pull you deeper in. The recreation of Van Gogh’s style and the feel of his work is genuinely impressive. Even when you can see that it’s Douglas Booth, Chris O’Dowd or Saoirse Ronan underneath the oil paint, there begins to be a real magic to what it’s doing which sweeps you up into a unique and yet strangely familiar world. It helps that while the story still has issues, it starts to feel more natural and less like the visuals are pulling the story around to fit the artist’s images. While the does illuminate some of what happened to Van Gogh, particularly in his final days, it never really feels like it gets to any real understanding of who he was. That is a bit of a shame as one of the reasons Van Gogh was such a genius is because his art allows you to see into his eyes and mind in ways few others have even approached. While the movie literally attempts to recreate his vision, story-wise it’s more interested in the (fictionalised) different ways people saw him, so that to one person who he was a nice man, to another he was a mad devil. One person could see why he would shoot himself, while to someone else that seemed impossible, despite his mental troubles. I realise that perhaps I’m a little biased, as I have my own thoughts and ideas about Vincent, and I suspect that as the movie stemmed from co-director’s Dorota Kobiela response to Van Gogh during a time of crisis in her own life, she is just looking at things differently. However, story-wise I couldn’t help feeling that it often missed the point, and missed important details of Vincent’s life that would undercut some of what it seems to be trying to say. Luckily, the visuals become so mesmerising that they help paper over the problems elsewhere. Overall Verdict: If you don’t know about Van Gogh, I’m not sure whether Loving Vincent is really that illuminating, and if you do, you’re unlikely to learn anything new, but as a visual experience it is impressive and just for that it deserves its Best Animated Feature Oscar nomination.